Renowned botanists have traveled from across the world to the Xishuangbanna Tropical Botanical Garden (XTBG) to take part in a symposium from July 6 to 9 on a surprisingly useful plant - ginger. More than 130 biologists and botanists from 14 countries and regions are attending the Fifth International Symposium on Zingiberaceae, more commonly known as ginger. The symposium not only discussed the latest findings and research about ginger, but also contributed to conservation of biodiversity, said Dr Chen Jin, director of the botanical garden. He noted that the garden's collection has more than 200 species of ginger, which provide a unique opportunity for its own scientists to conduct research in collaboration with international partners. "Indeed, we know that all plants in the family of ginger have economic value - they can be used as food additives, condiments and medicines - and are useful to our lives, but require special habitats to survive," he said. "But overwhelming environmental degradation has put these plants at high risk and effective conservation action will require long-term commitment from a wide range of stakeholders, not only scientists, but also policy makers, concerned citizens and the general public. "I am delighted that colleagues throughout the world have come to share their scientific and conservation works about the family of ginger. I hope that all of us will work together to provide strategies for the their sustainable use and effective conservation." According to Tang Jiahua, vice-governor of Xishuangbanna Dai Autonomous Prefecture, Xishangbanna is one of the major centers for ginger species and a place with richest biological diversity in China. At present, 17 genera and more than 110 species of gingers have been recorded in the region. Its 12 local ethnic minority groups have a long history of recognizing and using the ginger plant. Besides ginger species commonly used as condiments and medicines, the cultivation of sha ren - or Amonum villosum fruit - popularized and widely planted in Xishuangbanna since the 1970s has become an important source of income for the people who live in its mountainous areas. XTBG has placed great importance to the collection and study of ginger plants since the 1960s. "I believe that the symposium will provide a good platform for all of us to communicate with each other and promote study, utilization and conservation of ginger plants," said the official. The four-day symposium includes presentations and group discussions covering such diverse fields as taxonomy and systems, molecular studies and phylogeny, phytochemistry and pharmacognosy, biodiversity and conservation, horticulture and hybridization and all aspects of ginger biology. Participants presented 95 abstracts of their work. 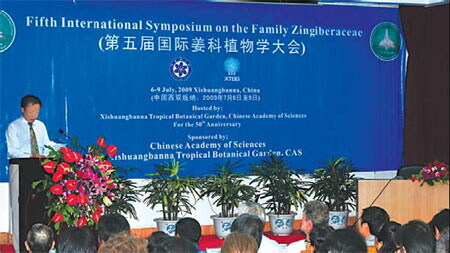 In addition to Dr Chen, the academic committee was composed of such leading biologists as Dr W John Kress from the Smithsonian Institution in the US, Dr Mark Newman from the Royal Botanic Garden in the UK, Dr Day Baker from Harold L Lyon Arboretum in the US, professor Wu Telin from the South China Botanical Garden, Dr Jana Skornickova from the Singapore Botanical Garden, professor Mamiyil Sabu from the University of Calicut in India and Dr Piyakaset Suksathan from Queen Sirikit Botanic Garden in Thailand. Participants in the symposium came from as far afield as Bangladesh, China, the Czech Republic, India, Indonesia, Japan, Laos, Malaysia, New Guinea, Singapore, Thailand, the United Kingdom, the United States and Vietnam.